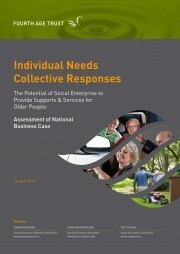 This report assesses the national business case for a social enterprise to provide services for older people in Ireland. The proposed social enterprise will be constituted as a ‘charitable trust’ under the Charities Act 2009 and will have a different legal status to a public or private body. It will trade commercially but with a social rather than a private purpose and its surplus will be re-invested in this social purpose. The proposed social enterprise is informed by the same vision for older people that also informs national policy, namely, “to enhance the quality of life of older people, maintain their full potential, support them in their homes and communities”1 and enable them “to live in their homes for as long as possible rather than go into residential care”.